Newcastle Benfield came from a goal down to beat Ryhope CW 3-2 in their Northern League Division One match. Ryhope went a goal up through James Ellis in the first half, but Benfield responded before half-time. 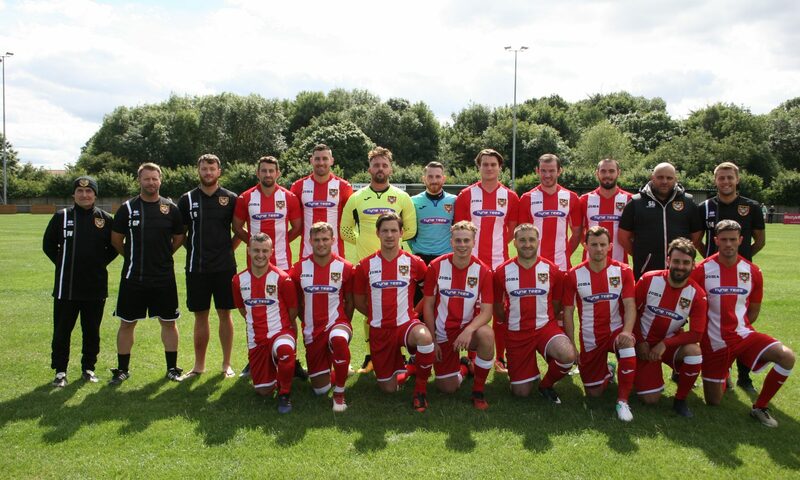 Two second half Dennis Knight penalties gave Benfield a comfortable lead, before Gary Shaw’s 89th minute goal left Ryhope with a fighting chance. Colliery Welfare’s form has now hit a bit of a slump, winless in their last three league games. Both teams and the fans observed a minute’s silence in remembrance of the heroes that lost their lives in conflict. Newcastle Benfield had the first good chance, in the first minute Dean Holmes was through on Ryhope’s goal but was denied by Jonny Ball. Mickey Rae hit a decent effort in the 5th minute, just wide of Benfield’s goal. Then in the 11th minute Paul Brayson had a very nice break through the Ryhope defence, only to send the ball over the crossbar. The away team kept the pressure until they were stunned in the 24th, a fantastic bit of play between Ellis and Matty Weirs, the latter with a backheel assist to send Ellis through before he added a cool finish. Ryhope began to regain control of the match, Rae and Ellis had a strong connection up front building up to many chances. Benfield had some good opportunities and in the 33rd minute got the equaliser when Jake Orrell sent the ball into the bottom corner of Ball’s goal. Both teams had chances to head into the break with a lead, but the scores were level at half-time. Newcastle Benfield started the second half stronger, but Ryhope also created some good chances. In the 61st minute the referee gave a questionable penalty for Newcastle Benfield that was converted by Knight to make it 2-1 for the away side. Just after the goal, Brayson hit a good strike that Ball tipped onto the bar, keeping the pressure up on Ryhope. Ryhope made changes, hoping that they could make a key difference to turn the game back in their favour. The home side after the substitutions had two great chances by Ellis and header by Danni Lay that was denied by the keeper. In the 83rd Minute Danni Lay’s strong challenge saw him receive a yellow card and concede a second penalty which was again converted by Knight. Ryhope got back into the match scoring in the 90th minute, Gary Shaw taking advantage of Danni Lay’s shot that was deflected into his path for him to finish to make it 3-2. That was to be how the game would end, Ryhope will look to bounce-back when they play Bishop Auckland at home on Tuesday.